That is the only way I know to start out this post, as it was exactly one year ago today that my blog Smart Southern Style first went live! I can't thank you all enough for joining me on this journey over the last year. Whether you follow me on Instagram or Facebook, read and subscribe to my blog posts and/or purchase items I share, I am so appreciative of your support! For at least a year before launching Smart Southern Style, I had thought about starting a blog, but kept telling myself I was crazy to take on something else. After all, I already had a demanding full time job that required travel, two beautiful daughters who were busy with activities, a hubby I wanted to spend time with, and other family relationships and friendships to maintain and grow. However, I finally decided to take the plunge into blogging and am so glad I did! It has been WAY more work than I thought it would be, but I have enjoyed every minute! What have you learned after a year of having a blog? As I referenced above, blogging takes a lot more time than I thought it would. I thought I would just post a photo or blog and people would just find me. Nope! Building and growing a blog takes a lot of time - engaging on your posts and others, planning content, writing blog posts, networking with other bloggers and brands, the list goes on! I have also learned that it is important to be grounded in a firm foundation of who you are and not get swept up in the game of comparison. When we are comparing our "insides" to someone else's "outsides" (Instagram feed, clothes, number of followers, etc..) it is easy to experience feelings of inadequacy. But, nothing I see on a phone or computer screen can compare to the grace and love of Jesus, my family and friends. If I fall into the comparison trap, I will take a break from social media and blogging and spend time doing what fills me up. What advice would you give someone just starting a blog? Set goals for yourself, but make them realistic. When I first started, I said I would write two blog posts a week. I quickly found that to be unrealistic with the limited amount of time I had available. In addition to setting realistic goals, I would pinpoint the target audience you are trying to reach. For example, the objective of Smart Southern Style is to provide fashion inspiration for busy mamas in their 30s and 40s who want to live a fashionable life without breaking the bank. And my last bit of advice...HAVE FUN! Give yourself grace, make the most of every opportunity that comes your way and enjoy the ride! How do you balance your blog with your full time job and personal life? I'm not gonna lie, it is TOUGH! I love to put 110% into all of my "jobs" - wife, mom, corporate job, blog - but that leaves little time for me! There have been times in the past year that I have had to put the blog to the side when other parts of my life are busier than normal. This balancing act is still a work in progress, but I am trying to give myself grace and not be as hard on myself. And I am thankful to have a supportive husband who has taken on even more with our family since I started blogging! What have been the highlights of your first year as a blogger? This is a tough question, because there have been so many highlights! Being able to connect with all of you has been the best part of starting this blog. When I get an email or DM from you saying that you found inspiration in some way from something I posted or wrote, it is the highlight of my day! In addition to connecting with all of you, I have been able to meet some amazing ladies who are also fashion bloggers. They have been so helpful and kind and I want to specifically thank Anna DeLeon of Peppered in Style and Jan Correll of Silver Is The New Blonde for meeting with me and answering a bunch of my questions when I was just starting out. (Give them both a follow if you don't already!) I have also been able to work with some amazing brands in the last year and I am so thankful! Who takes all your blog photos? I work with a fabulous photographer named Deeana Beckley, with Deeana Kourtney Photography. She is great to work with and was so helpful and patient when I did my first few photo shoots. I asked her questions like "What do I do with my hands?" and "How should I pose?" because I was completely clueless and she gave me great advice and suggestions. If you are in the Charlotte NC area, I highly recommend her. Occasionally my sweet hubby takes photos of me, especially when we are traveling. I am actually wearing several of my favorite fall trends in the photos in this post. Leopard (or any animal print) is definitely one of my favorite trends. Even if you don't want to go bold with a sweater or skirt, you can incorporate some leopard in a more subtle way with a belt or handbag. I also love burgundy and plum colors for fall. You can wear them with clothing, a handbag or even with your lipstick or nail polish. I am also loving pointed toe booties for fall. I think the pointed toe gives them a bit of a dressier look, and you can wear them with anything from jeans to a dress. Do you have one article of clothing that is your favorite? I have a basic black sheath dress I bought about 5 years ago for an event that is still in my closet. It is flattering and timeless and can be worn so many different ways. I have worn it several times over the years and continue to hold on to it because it it is a classic piece that is easy to put on if I cannot figure out what else to wear to an event! I tried to cover as many questions as I could without this post getting too lengthy. If you have any questions that I did not answer in this post, feel free to comment below or send me an email. Thanks again for reading Smart Southern Style and making the past year so much fun! Happy Fall, Y'all! I'm so excited that October is finally here. It is one of my favorite months for so many reasons - cooler temps, leaves changing colors, our family trip to the NC Mountains, and of course fall clothes! I love the deep jewel tones that you often see in fall clothes as well as the cozy cardigans and boots that are staples this time of year. I am excited to be highlighting fall fashion on the blog with another 4 For Fashion post today. If you are new around here, here is a little info about our fabulous foursome. 4 For Fashion is a style tribe of 4 bloggers who all believe that you can find something that fits your personal style just about anywhere. Our ages range from 20s to 50s and our goal is to provide fashion inspiration to ladies of all ages. If you missed my previous posts featuring these lovely ladies, you can read them here, here & here. 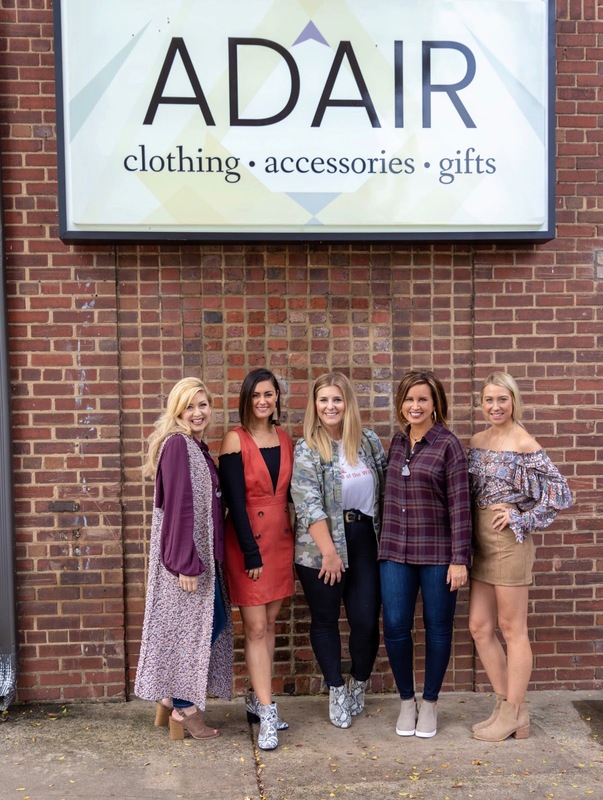 Today we have partnered with Adair to share a variety of fall looks. 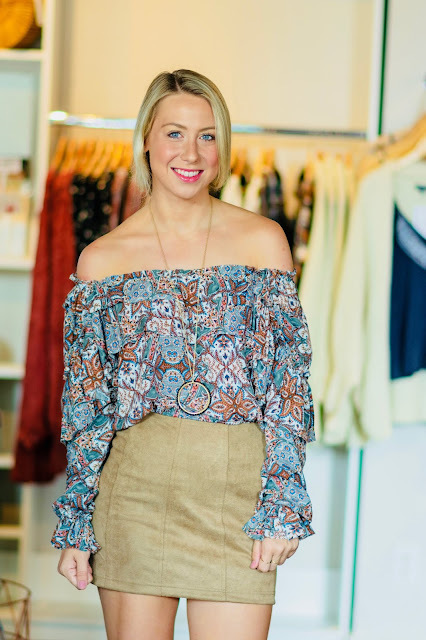 Adair has a great selection of casual pieces as well as those that are perfect for a night out. They also have a fun assortment of accessories that will be sure to complete your look. If you are looking for a gift for someone, they have some cute gifts such as candles, quirky signs and other household items. One of my favorite things about Adair is how affordable everything is! All of the pieces that I personally purchased at Adair were priced under $60. First, let's start with my outfit. I chose a plum colored plaid button down top for a casual, everyday look. Plum is one of my favorite colors to wear and the plaid just screams fall to me. The different color fabric with flowers embroidered on it on the back make the top unique. I paired it with denim, but you could also dress it up a bit with a skirt. You could also layer this top under a cardigan when it is cooler outside. Adair has some pretty and unique accessories and I found several to wear with my outfit. I love layering necklaces, so I picked a choker with a black stone and added a longer necklace with black velvet and a grey stone. I finished off my look with some brushed gold earrings by Sheila Fajl. These are my new favorite pair of earrings! They are lightweight, go with everything and I literally have worn them every day since I got them. Next we have a super cute look by Rachel from Queen City Chic, our 20-something blogger babe. Rachel chose a pretty off the shoulder top full of beautiful jewel tones. I love the blousy sleeves! She paired it with a taupe suede mini skirt and finished off the look with a long necklace. Both of the pieces she chose are so versatile. You could wear the top with some skinny jeans and booties and the skirt would also look great with a solid black or white top. LauRen from All of the F Words chose a jumper dress in the perfect fall hue! LauRen wore a cute off the shoulder black top under the dress which brings out the black buttons on the jumper. She added some statement tassel earrings and finished off the look with some great snakeskin booties. The black off the shoulder top would also look good with jeans or a skirt. And those snakeskin booties...well, they would look fab paired with jeans, a skirt, you name it! Finally we have Barbi from Southern Blonde Chic. She chose a duster cardigan vest with shades of plum and white. She paired it with the prettiest plum blouse with balloon sleeves which I love. She added a long necklace to finish off her look. You could also wear the plum blouse with some black jeans and boots for a dressier look, or pair it with some black or tan dress pants for work. We were really tempted to take a ride on this scooter parked outside the store! As you can see, we all chose different looks, some dressier than others, and we found the perfect accessories to go with each outfit. You can find all of our looks at Adair. They have two locations in the Charlotte area: their flagship store in downtown Concord and their new boutique in the Southend area of Charlotte. For those of you who are not local, you can shop on line here. They post new items all the time on Instagram so be sure to follow them for updates on all their new arrivals. If you stop by the store, be sure to tell them that the ladies of 4 For Fashion sent you! Stay tuned for another edition of 4 For Fashion coming soon. If there is a particular style or shop you would like to see featured in this series, please comment below or send me an email. And don't forget to follow along on Instagram here and on Facebook here. Thank you so much for reading Smart Southern Style. I really appreciate you stopping by!